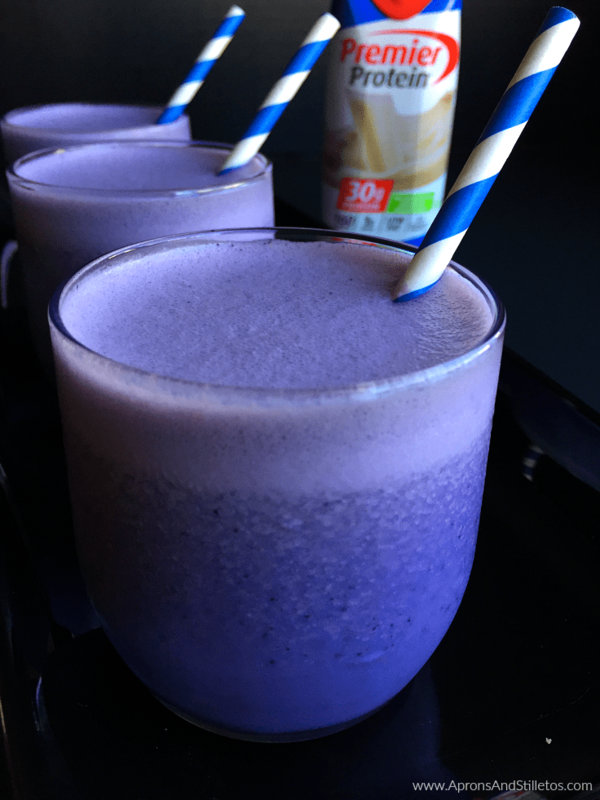 This creamy Blended PB&J Smoothie recipe is a sponsored post written on behalf of Premier Protein. All opinions are mine. I’ve been out of protein for a few weeks and it’s but a real damper on my morning routine. Not only that, my husband and I have been going to the gym earlier in the mornings this year than last year which doesn’t give us time to make those protein-rich, pre-workout breakfasts of eggs, oats and turkey bacon we were making last year. Since switching our routine, I’ve been drinking fruit and veggie smoothies which are amazing, but they just don’t give me the energy and endurance I need to lift weights. So this weekend my husband and I decided to replenish our protein supply with single serving shakes from Premier Protein®. We’ve usually use protein powder but decided to incorporate single serving protein shakes to use in the mornings which are now busy for us. 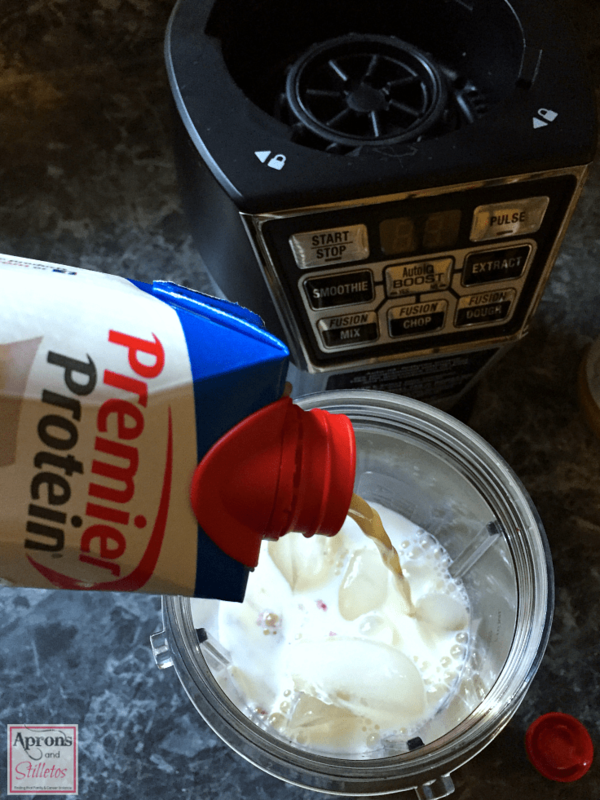 We specifically wanted Premier Protein® Organic shakes we learned were sold at Costco. We didn’t have a Costco membership but decided to visit the store to club to look around. We ended up leaving with a Costco membership, and some Premier Protein® Vanilla shakes. We didn’t find the organic shakes we wanted because it’s a new product and not available in my local store yet but could be ordered from Costco.com. For this week we just grabbed a box of the 18 count vanilla shakes. The Premier Protein Organic Shakes combine the finest organic ingredients, without all the sugar fat, and calories, to give you the energy you need every day. • No antibiotics, synthetic hormones, toxic pesticides or GMO ingredients. • Combining these quality ingredients with natural chocolate and vanilla flavors create a delicious and nutritious protein supplement. 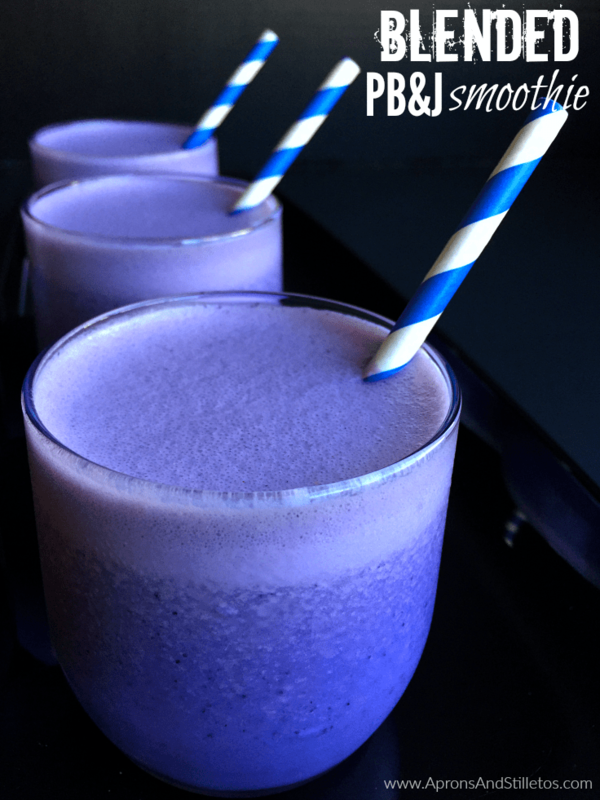 I’m planning to use these shakes as my on-the-go option, but I want to show you how you can incorporate them into different smoothie recipes like this Blended PB&J Smoothie. Combine all ingredients in a blender and blend on high until smooth, then enjoy! Visit premierprotein.com for more great recipes! I've never added peanut butter in the smoothie ever. So, this is something new I learnt today. Thanks for sharing the smoothie recipe! Can't wait to try! Yes peanut butter is great in smoothies. I just posted a recipe for a Choco Nut Shake that uses peanut butter. It takes like a chocolate shake. This looks so delicious and I'm all about smoothies for breakfast. 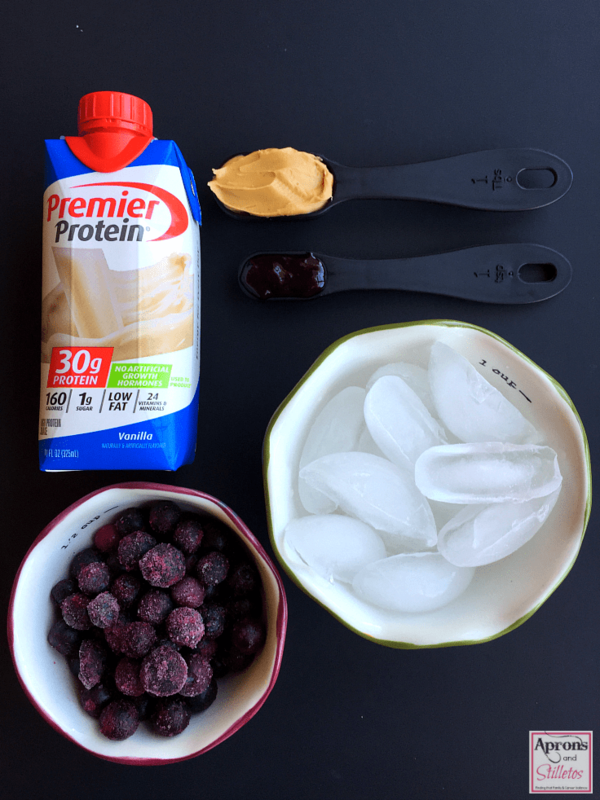 Love the addition of protein shake for that extra energy & the berries add so much flavor too. Hey Molly! You're so right! This thing is layered with flavor. That's so true. I drink my shakes before hitting the gym. Very interesting combination! I will have to check this out because I am wanting to start to be more healthy. This is definitely a great place to start. This would make a great breakfast substitute or snack. Ummm yummy! I was actually craving a PB&J today. I could actually make this! Would need to go get blueberries though. Looks delicious! Maybe it's healthier than the sandwich? I think it's about the same if you make your sandwiches with 100% whole wheat brad like I do. This version you're just able to add Premier Protien which increases your Protien intake by about 25 grams. If she likes pb&j she'll love these smoothies. I had drink my Proteins just with blueberry juice but this Looks very delicious! 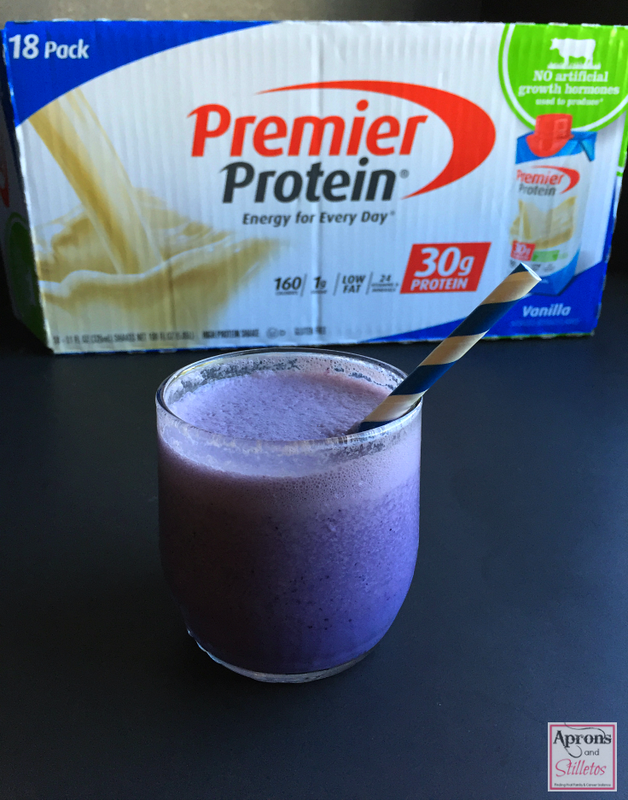 Try mixing vanilla Premier Protein with blueberries ice and little Blueberry juice. I'll bet that tastes good. Oh my gosh, yes! I so love this color and I imagine it tastes delicious. It does have a sweet flavor Blair from the creamy vanilla Premier Protein shake, but not too sweet at all. The tart blueberries and nutty peanut butter balance out the flavors. This sounds like a delicious smoothie! I haven't thought about adding peanut butter to a smoothie before. Are usually mix peanut butter with chocolate Pure Protien ice and banana. That's a good combo too. Ha! Me too. I feel like a kid again. That color is amazing!!! I love that you were able to order online because it wasn't in the store. I often forget about the ability to do that and shop somewhere else. I'm really starting to switch over to online ordering because so many stores like Costco.com offer drive up pick ups. They literally get your groceries for you that you ordered online or you can pick them right up. MMM I love anything with blueberries or blackberries and smoothies are such a weakness of mine! Never thought to mix peanut butter with anything but bananas though! I like how you got creative. Heather I wasn't sure about the combination either but when I tried it it was so good. I'm looking forward to incorporating peanut butter in more smoothies in the future . Love that it's a healthy amd quick smoothie. Will have to try it out soon. It looks so good! Definitely try it and tell me how you like it. They shake definitely has that classic peanut butter and jelly with milk flavor Adriana. I love that this smoothie is purple! I really want to try this simple recipe out!! You should try Kimberley it's really easy to make and it's so delicious. Great post, Saidah. And, those purple smoothies?! Purple smoothies for the win!! Th smoothie colours looks so nice.. I wanna drink it too! Thanks friend I love the way the recipe picture turned out as well. I never thought of using shakes before! That's a great idea! I'm going to start doing that for my protein shake in the morning. Also, this shake is gorgeous and I bet it tasted good too! I was actually surprised by the color of the shake. I guess that's because I use the berry jam and blueberries. I keep Premier Protein around for that very reason. Sometimes I just I'm not ready to cook or I'm not ready to eat and protein shakes are perfect for those times. I've been wanting to try their chocolate flavor! It's only 2 WW Points. I could start taking this on-the-go for breakfast! Yes these Premier Protein on the go bottles are definitely perfect for taking out the door in your purse of gym bag. I think this may change my husbands life. PBJ is pretty much his fav thing and he tries to drink a smoothie everyday! I love a good peanut butter and jelly sandwich myself. Now that I can have it in a cup I'm happy. Smoothies can get boring if we don't switch them up, but this is definitely a great one. You should try it De. What a great recipe! I've been looking for something different for my workouts and this sounds great! I was looking for something different as well Courtney. When I saw this recipe I was a little skeptical but it turned out delicious. I need to get this Premier Protein for my husband. He needs to gain the weight he lost after hip replacement surgery. I mean, not a lot of weight, but at least some weight. The proteins would help build up his muscle mass again and maybe that will make him feel a whole lot better. Thanks for letting me know about this wonderful product. Hey Eileen protein shakes will definitely help with that. 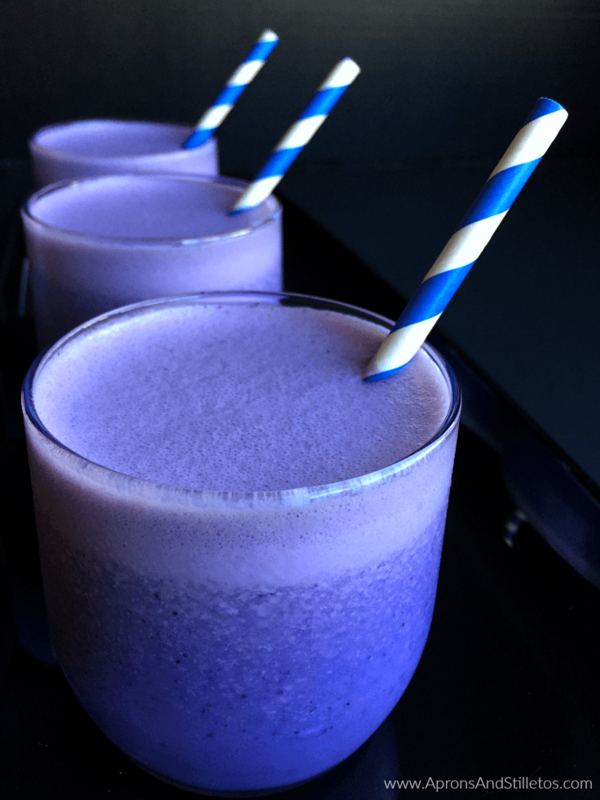 How can we resist a purple smoothie? This looks so vibrant and delicious! We're doing a Costco run this week, we'll look for Premier Protein and get crackin. This looks delicious. I am going to have to make it for my husband one morning before working out. He loves pb&js adnd drinks protein shakes before each workout. Do you have an alternative recipe for a toddler or would this be okay for him to drink? For a toddle I'd omit the protein. Also the peanut butter if they have allergies. Substitute the protein with cow milk or nut milk. Oh now this is a fun smoothie idea! The Premier Protein shakes are probably perfect for all sorts of flavor mixtures like this! You're so right. I think Banana, chocolate or strawberry Premier Protein shakes would be good in this as well. It definitely is. You should try it. I used to drink smoothies after surgery. The color of this one is terrific. Thanks Val! I never know what color will dominate.